Georges River kayaking. Maps, directions, photo's and trail head. Georges River Kayak, launch at Fitzpatrick Park, at the end of Carinya Rd, Picnic Point. There are plenty of easy spots around there to get your kayak into the water. You now have a choice of kayaking up stream or to paddle down stream. I kayaked down stream along the Georges River National Park and checked out Mill Creek. The best time to kayak along Mill creek is at hide tide to avoid the sand bars and get as far down Mill Creek as you can. At hide tide you should be able to go about 2km. Mill Creek is worth doing. 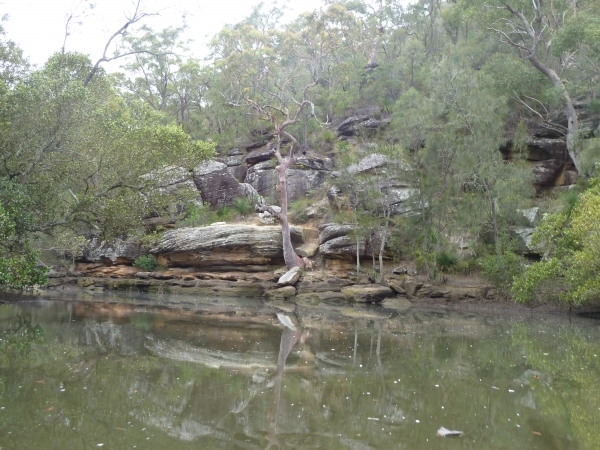 Is one of the more scenic parks of the Georges River. Though I really enjoyed kayaking along Georges River National Park as well. I have to organize a picnic down there one day as it looks great and there weren’t that many people using it. Little Salt Pan Reserve is worth a look. Nice little spot among the mangroves. On the day I kayaked past the Alfords Point Bridge. I stopped at the little beach to have some lunch. I have seen this beach numerous times driving over the bridge and had to check it out. I kayaked a further 2km’s down Georges River before I thought it was time to head back. The round trip was 16km’s. Though you could do a lot more if your fit enough. Next time I’ll kayak up stream to see what’s in that direction. I also want to make it to Como Bridge. That will be for another day. Kayaking on Georges River Photo Gallery.